The WHLAXLE24A axle is a FLANGE style axle made of 6061-T6 AL alloy. This axle has a 1.25 inch diameter bearing surface and is designed for use with the WHLNW501.25 and NW511.25 nose wheels. This axle assembly is designed to allow rigid column support of a fork type nose landing gear yoke. 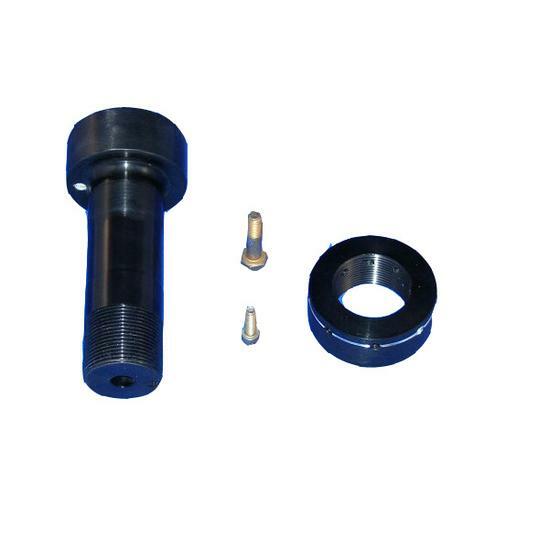 The locking axle nut allows bearing preload torque to be applied separately so that deflection effects of the nose gear fork to not introduce oscillating bearing preloads. The 2 inch diameter flange has a 0.25 inch tapped hole for restraining rotation of the axle assembly in the landing gear fork. The WHLAXLE24 is designed for use with 4.6 inch wide forks (2 place RV forks) and has a 0.375 inch center thru hole. A fork width of 5.25 inches (RV-10) can be accomidated through the use of the WHLA24SPKIT spacer kit (kit contains two spacers & required hex bolt). The center hole provision also facilitates supporting wheel for tire balancing (see installation instructions below). Balance weight can be purchased as well (MSCLDWT) This axle assembly is an excellent replacement for two piece axles used on the RV style nose gear fork.